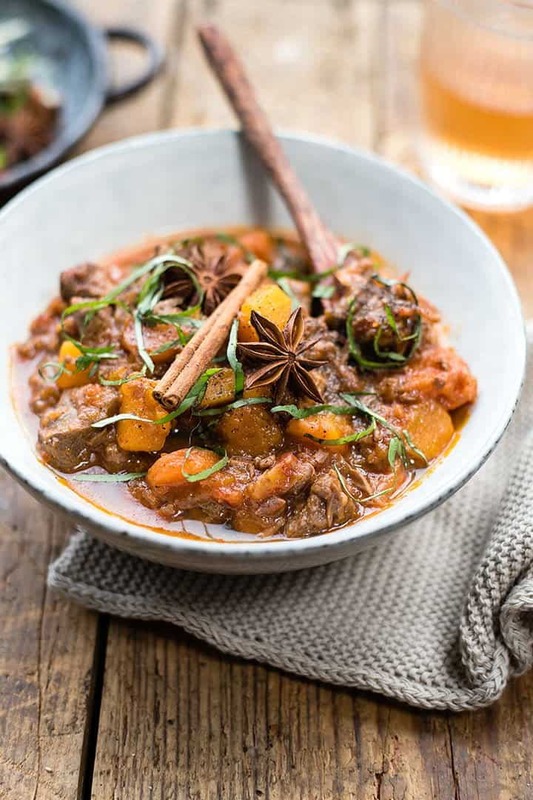 Make this aromatic Vietnamese beef stew once and it will become your new favourite Instant Pot recipe! Easy, delicious and a guaranteed hit with the whole family. A few years ago I published a Vietnamese beef stew recipe and it quickly became my most popular recipe, eclipsing all other sweet and savoury recipes. It is a favourite with my family, especially during the winter months when a bowl of warming stew is practically mandatory. Now that I am getting to grips with my pressure cooker, I naturally wanted to try and create an Instant Pot Vietnamese beef stew. And I am thrilled to report that, YAY!, it is just as delicious as the stovetop version and a lot faster. The recipe itself is very simple: first you mix the beef with five spice powder, garlic, lemongrass, sugar, salt and pepper. I took a shortcut and used garlic and lemongrass paste in this recipe, which is fine if you are in a hurry. Fresh garlic and lemongrass do impart a lot more flavour – ain’t that usually the way? If you have time, then leave the beef to marinate for an hour. I must admit that, more often than not, I only marinate the beef for as long as it takes to chop the remaining the ingredients. The beef is then browned, in batches, either in a large casserole dish or in the pressure cooker using the ‘sauté’ function. I found browning the beef on the stovetop a bit quicker as you can do it in just two batches. It is important not to crowd the beef cubes as they will just stew rather than brown. Once your meat is nicely browned, you can get on with sautéing the shallots and then adding remaining ingredients. The stew only needs 25 minutes cooking at high pressure and then an optional additional 10 minutes reducing the sauce using the sauté function. I have to tell you this was so freaking delicious that I was doing a little dance when tasting it straight out of the instant pot. I think you will agree with me when you make it! Serve this pressure cooker Vietnamese beef stew over rice or simply with some crusty bread to mop up every last bit of the delicious sauce. Have you made my pressure cooker Vietnamese Beef Stew? Make this aromatic Vietnamese beef stew once and it will become your new favourite Instant Pot recipe! Easy, hearty and a guaranteed hit with the whole family. Combine the beef, five spice powder, salt, pepper, lemongrass, garlic, soy sauce and sugar in a bowl and mix well. Ideally, leave to marinate for an hour, if you are in a hurry you can use immediately. Heat the oil in a large casserole dish or directly in your pressure cooker using the ‘Sauté’ function. Brown the beef, in batches, until seared on all sides - a couple of minutes per batch. Transfer the meat to a plate. Add a splash more oil and sauté the shallots for 5 minutes, stirring frequently – from this point on you can use your pressure cooker. Add the green chillies, carrots, squash and cook for 2 minutes. Stir in the tomatoes and their juice, cinnamon stick, star anise, kaffir lime leaves and stock. Return the meat to the pot and stir to combine. Cover the pressure cooker, set vent to sealing and cook for 30 minutes on high pressure. Let the pressure release naturally for 10 minutes, then release remaining pressure manually, taking care to keep your hand out of the way of the steam. Check the consistency of the stew - it’s likely the sauce will need to be reduced slightly. Stir in the cornflour slurry and use the ‘sauté’ function to reduce the sauce. Remove the cinnamon stick, start anise and kaffir lime leaves before serving. Taste and add more salt if needed. Serve over rice or with some crusty bread garnished with basil leaves. I used a 6L/Quart Instant Pot for this recipe. Although ideally you should marinate the beef for up to an hour for maximum flavour, you can also mix it with the ingredients as specified and set it aside while you prepare the remaining ingredients then use immediately. I love what you can do in an instant pot! This looks so yummy, I’ve never tried Vietnamese cooking before. It seems to use a lot of the same spices as Thai? 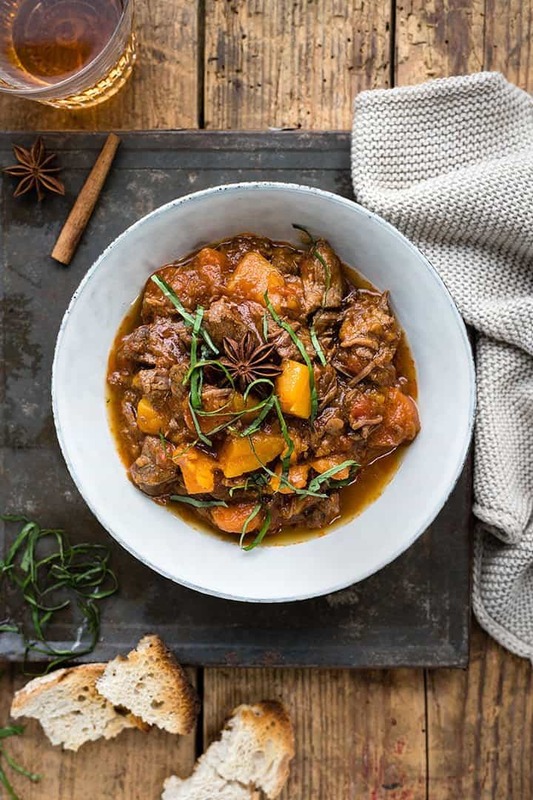 Everything about this beef stew screams flavor! Its sweet, salty, and perfect for the cold weather we have been having in Alberta. Well done! This looks and sounds amazing — and an instant pot recipe! win win!! Thanks Caitlin I hope you give it a try!